Hearing the Cries for Justice is a regional summit to equip people of faith and goodwill to support their neighbors impacted by the legal system. This one-and-a-half day event will bring together experts in the field—including those with lived experience, alongside professionals and faith leaders—to share opportunities for people of faith to help change hearts, minds and society itself. Over a series of summits held in different corners of the state we will connect people locally to build up the movement for justice. If you and your community would like to host a gathering of Hearing the Cries for Justice, we want to speak with you! We can bring this event to your region: just let us know you'd like to host us! Contact us at cosa @ emoregon.org or call (503) 221-1054 ext. 211.
WHO should attend: Anyone in the Eugene region who wants to network with others involved in criminal justice reform, or who wants to find new ways to get involved. SCHEDULE: On the evening of the first day, we screen the documentary film “Thirteenth” by Ava duVernay, followed by discussion. This film explores many facets of the US criminal justice system, and some of the systemic oppression on which it is based. On Saturday, our focus is equipping faith communities for the work of serving people impacted by the justice system. Local speakers with lived experience of the system ground our perspectives and keep our focus on our neighbors. Two tracks of emphasis can offer training in prison reentry mentorship and public policy advocacy. We also want to provide ample time for networking among faith communities already serving this population. Learn more about EMO’s Criminal Justice Ministries. Interested in hosting? Contact us today! On March 22-23, 2019, over sixty people gathered at First United Methodist Church of Eugene, to learn, plan action, and hear the cries for justice. This was the first regional gathering in a series we hope to hold around the state, engaging local communities in ways they can make a positive change for their neighbors. On Friday evening was a screening of the documentary film “Thirteenth” by Ava duVernay will be held at First United Methodist Church, followed by meaningful exchange and discussion facilitated by Rev J W Matt Hennessee, lead pastor at historic Vancouver Avenue Baptist Church in Portland. Saturday was full of stories and planning action for change. We were honored to be joined by wonderful partner organization leading our workshops, from Partnership for Safety & Justice and Sponsors Inc. Participants engaged in great conversation about actions they plan to take with their congregations, supporting people through reentry from prison and advocating change through legislative advocacy. We were honored to get to recognize Rev. 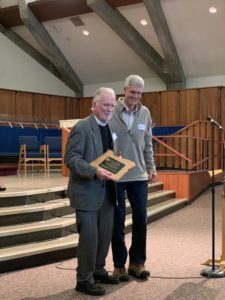 Deacon Tom English for his nearly two decades of service to persons in the Lane County jail, with an award from Chaplain Chris van Lobedan. Religious communities and people of faith have a special role to play in transforming the institutions that make up our criminal justice system - and in transforming the lives of their neighbors who are impacted by that system. Alongside professionals in treatment and law and corrections, alongside people who are incarcerated, alongside survivors of violence and crime, alongside family members of those behind bars, people of faith have a role to play. Our motivation is rooted in the values of Restorative Justice, which recognizes that the community has a role to play, as well as victims and offenders, when harm has occurred. Community has a role to play in preventing harm, and in transforming systems to reduce oppression and violence. The community - the public - has a role to play in public safety, and public safety is incomplete when it is left to paid professionals to manage and mitigate harm. We all have a responsibility to help reduce oppression, crime, and violence. As taxpayers, voters, neighbors, and members of society, we are already playing a role in the justice system as it is. Whether we recognize that fact or ignore it, we are part of that system, and unless we are actively working to change that system for the better, then we are keeping that system in place as it is. Restorative Justice values, which complement our faith values, together call on us to become informed, thoughtful, and active participants in our communities - including being active in calling to change broken systems and encourage healing instead of furthering harm. Religious people have a special role to play as community members, because we are inspired and distinguished by our acknowledgement of the spiritual dimension to our lives. And the brokenness within our criminal justice system is, at its heart, a spiritual brokenness. Our justice system enacts our society's values, even though most of us would not want to claim that these ARE our values (two of the most poignant: in positing that violence and control are appropriate responses to "solve" violence, and in creating a society shaped by stark racial disparities). This speaks to a deep spiritual brokenness, not only in our legal/justice system, but in our society at large. And so, it is incumbent on religious people to become aware of and active in our legal system - and help lead a society-wide transformation toward true justice and toward values we WANT to uphold. On January 30, 2018, EMO was honored to host the inaugural convocation dedicated to engaging Oregon's faith communities for criminal justice reform and service. Held at Trinity Episcopal Cathedral in Portland, and sponsored by the Episcopal Bishop of Oregon Foundation, Episcopal Diocese of Oregon, and Episcopal Diocese of Eastern Oregon, this convocation brought together diverse voices from across the state (and beyond) to start crafting a vision of how religious communities can help move Oregon to be a more just home for all. Called Hearing the Cries for Justice, this convocation is the first in what we hope will be an annual event. Participants were invited to take follow up action, to bring what they learned home to their communities. Download this list of ideas for ways you can take actions to Heal the Justice System, Heal Our Communities, Heal Ourselves, and Become Healers. Whether or not you were able to attend this convocation, you are invited to take action, to host a Criminal Justice Sabbath this year with your congregation (learn more about Criminal Justice Sabbath), to keep learning more about criminal justice issues, and to donate to support this work.